Back-Up Story: "History of the Multiverse - Chapter One"
Jimmy Olsen talks with Lois Lane on his cell phone from Arkham Asylum before Killer Croc suddenly attacks. Somehow Jimmy manages to stretch his body, much like Ralph Dibny, but neither he nor Croc, who is taken down by Arkham Security, believes that it actually happened. Meanwhile the Monitors gather to admonish the one who killed Duela Dent. The rogue Monitor insists that he is simply doing what the mandate of the Monitors demands. While his brothers argue the point this Monitor feels that they should attack the problems of beings crossing from one reality to another with brute force to avert another Crisis. He ends his speech by asserting that he can't murder those creatures that shouldn't be alive in the first place. On the Justice League Satellite Red Arrow takes a crack at questioning Karate Kid. Down on Earth Pied Piper and the Trickster continue their "audition" with the Rogues. Piper convinces "Bear Market" Boesky to give up his fortune and then throw himself into the ocean while the Trickster prepares to detonate the robber baron's boat. Mirror Master believes that Piper has transferred Boesky's fortune into his account, but with one stroke of the keyboard Piper makes the money disappear as revenge against Mirror Master killing his parents. After the group calms down Trickster reveals that he knows that Piper didn't send Boesky to his death and blackmails Piper into giving him the money which Piper had sent to a homeless children's fund. In Gotham City Mary Marvel is on the run from a group of thugs. They chase her into a building that Mary almost feels drawn to. Before they can do any real harm Black Adam kills her would-be attackers before turning on Mary himself. Mary tells him who she is which leads Adam to believe that the day isn't a total loss. In the time stream the Monitors gather to review the history of the Multiverse. In the beginning a single black infinitude was pierced by a light which grew and eventually exploded into the Multiverse, multiple worlds vibrating on different frequencies yet existing side by side. The realities were never supposed to know that the other existed until Barry Allen, the hero known as the Flash, managed to travel from his reality to that of a Flash named Jay Garrick. After sharing an adventure that involved fighting Garrick's enemies, Barry Allen returned home thinking that they'd never see each other again. He was wrong. They would meet again and again with more people getting involved never knowing that they had glimpsed the smallest shard of the great future yet to come. 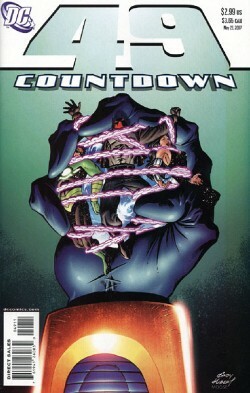 Main Story - 4: This third/forty ninth issue of Countdown is giving me the same sense of uncertainty that the same issue of 52 did. It is so early in the game that I am finding it hard to get a solid sense of what is going on and how I feel about the story. This is the blessing and the curse of a weekly comic book and why it is such a fun ride to climb on to. That is the only comparison I can make between the 52 and COUNTDOWN. I think there are so many differences in terms of the raison d'etre and execution that any attempt to compare and contrast would be unfair and completely useless. It's like trying to compare DARK KNIGHT RETURNS with WATCHMEN; sure you could do it but they both represent such different aspects of the super-hero genre that doing so would sell both works short. 52 was an attempt to look at the DC Universe without the mitigating factors of the supposed Trinity of Superman, Batman and Wonder Woman. It celebrated the lesser known heroes and villains and the end result was an epic story of heroism, redemption and the creation (or re-creation I guess) of a Multiverse with nearly limitless potential. From what I have gotten out of the first three issues COUNTDOWN is a celebration of that limitless potential and an attempt to play with as many toys as possible. I look at it this way; 52 was a cool independent film that had a solid story with characters I really cared about. COUNTDOWN is the summer blockbuster that appeals to a wider audience. Both can be compelling and fine films, just different. Again, though, I have some misgivings. The return of Elasti-Lad wasn't one of them. Dini and Bedard played that hand well and the characters' confusion was a good mirror of my own. No, the misgiving I have concerning young master Olsen is that fact that he knows who the Red Hood is. He also seems to know who Nightwing is. It doesn't take a master detective to put two and two together and figure out that Bruce Wayne is Batman. Heck, a fourteen year old kid did it and he got the gig as Robin. I'm sure there is an explanation in there somewhere (maybe in an upcoming issue of SUPERMAN or ACTION COMICS) but for right now I'm scratching my head. This doesn't mean I don't like it or that the writers should reveal all of their cards right at the beginning. I'm just a tad confused, which is probably the point of that particular storyline. The Monitors are an interesting mystery as well and my only problem here is that the ending might not be worth all the fuss and bother. It's just too early to tell. I did like the fact that the scenes with Karate Kid and Red Arrow reflect the events of "The Lightning Saga" that is running through JUSTICE LEAGUE OF AMERICA and JUSTICE SOCIETY OF AMERICA. I seem to remember someone saying that this book would be the spine of the DCU (or DCMU I guess) so seeing things in here that are on a somewhat even timeline with things out there is pretty dang cool, so props to the writers for pulling this off. And I guess it goes without saying that I am glad that Black Adam showed up at the end. Oh yes, I will be looking forward to seeing how this particular sub-plot plays out. For now, though, I am going to sit back and watch the story unfold a little more before I come up with a firm opinion on the subject. The aggravation and thrill of a weekly book is the wait, but I knew what I was getting into when I put this book on my pull list. Main Art - 4: You know, even if I didn't like the art in this issue (which I did) all would have been forgiven right at the end with the image of Black Adam descending from the heavens on a mission of righteous anger. Yeah, it's biased, but I think that any decent fan is biased about at least one thing. The rest of the issue was great as far as the art goes. It's that last shot that made me smile. Back-up Story - 4: This is an interesting bit of storytelling to bring back. I enjoyed the History of the DCU stuff from 52, so this arc feels natural. I can't help but feel that they were leading us on in 52, but lulling an audience into a false sense of security and then pulling the rug out is the job of a good storyteller. Jurgens laid out the beginning of the Multiverse out in a straight forward manner that, to me, would let a new reader in on what happened without a whole lot of minutia. This is another aspect of the series that I am going to put on the "wait and see" list, but I have a good feeling that I will end up liking the final product. Back-up Art - 4: Four pages is not a lot of room to tell a story in. I realize that this segment is a serial, but at the same time Jurgens and Rapmund pack a lot of story into those four pages. I enjoyed their interpretations of the Flashes of two worlds in addition to Jay Garrick's enemies. This was a solid four pages of art. Cover Art - 4: So, you think that Ion, Donna Troy and Red Hood are important to this series? This cover is a little too ambiguous for me. I hope they clarify this at some point. All kidding aside this was a powerful and symbolic cover. It isn't my favorite thus far but very good just the same.